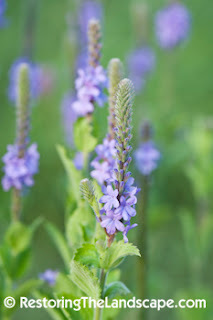 Hoary Vervain is flowering right now alongside our Gray Headed Coneflower and Wild Bergamot. A perennial native of sunny dry locations. It is found in prairies as well as disturbed sites such as along railways in sandy soils. It's a great candidate for hot dry locations. The 5 parted blue to purple flowers are arranged in a spike that flower from the bottom upwards. The blooms open in July and often flower into September. Many types of bees like to nectar on the flowers, but I find it's not their first choice when the Wild Bergamot is flowering. The opposite arranged leaves are coarse to the touch and covered with white hairs. 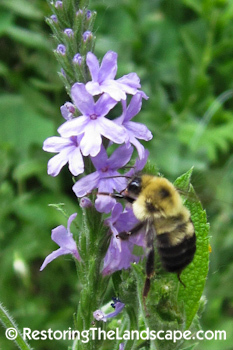 Hoary Vervain is a tall linear plant, reaching heights of 3 feet in years of good moisture and richer soils. It is very attractive massed together and goes nicely with Butterfly Milkweed, Gray Headed Coneflower and medium sized prairie grasses. See map below for native range.